Home / Style Ranger / Can Being Practical Still Be Cool? Can Being Practical Still Be Cool? Style Ranger picks for running errands while looking and feeling great! 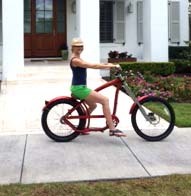 Here I am cruising around Orlando on my friend's fancy bike! P.S. I got tons of compliments (mostly on my bike but that still counts). I'm not always the most outdoorsy gal but when I do go on an adventure I make sure to look the part. When you are having fun you always look good but a great outfit adds a little more punch! Do's - shorts, fitted tanks or tees, sunscreen, minimal accessories, cross body small purse, hair back so it doesn't blow into your face or lip gloss, fedora or baseball hat to block sun, bright colors so people see you, slip on sneakers or sandals with a strap to keep on feet Don'ts - restrictive clothing, fringe, dresses or skirts, too many accessories, flowing tops, absolutely no heels or flip flops Hangovers - we've all been here before at some point and probably could have looked and felt better with a little effort. Thank God as I've gotten older I've also gotten wiser but I still could use a couple of style tips once in a while when I'm at my worst. Most important thing to me is to cover myself up and not be recognized by anyone in that state so a baseball cap or fedora is a definite must. Sunglasses help too but my best bet is to keep my outings limited when I feel like death. Celebrity Glamour Shots: Angelina Jolie, Hayden Panettiere & Sandra Bullock all look stunning and their clothes compliment their looks! If you have any do's or don'ts for life's style that you think are practical or helpful, please comment. I love feedback and enjoy hearing other people's thoughts. Hope this blog was fun to read and informative. I loved this blog. It is fun, breezy as well as being right on target. Glad you’re writing and it’s nice to learn these things earlier rather than later.